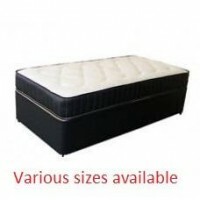 Description: Excellent value for money bed, with spindle headboard, available in 3',4' and 4'6, An extremely popular bed used widely by teenagers as a first double bed. See the matching Pickwick furniture in our furniture section. The headend and footend have double bolt fixings for extra stability . The sturdy spindle design of the Pickwick is a classic design and historically one of the best sellers. The pine has the inherent strength that man made chip boarded products just can't match. Simple design simply the best.